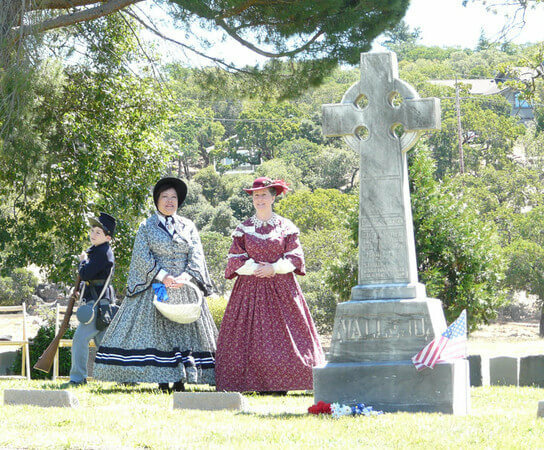 The information on this tour was researched and written by Nancy S. Brennan, honorary historian of Tulocay Cemetery. The history of Tulocay Cemetery is the history of the Napa Valley and the surrounding community. The markers and mausoleums, from the opulence of the Victorian era to the ground level gravestones of today, reflect the diversity of our heritage. Established in 1859, the land was donated by Don Cayetano Juarez to the people of the Napa Valley. Today, Tulocay is a private, non-profit, non-sectarian cemetery and is under the care of the Tulocay Cemetery Association. Approximately 20 of the original 50 acres are yet to be developed. Tulocay will continue to serve our community well into the 22nd century. Tulocay has developed a larger than average Endowment Care Fund, that has continuously increased since its establishment. The income from this carefully managed fund is used, and will continue to be used, to maintain the neat and attractive appearance for which Tulocay is known. We offer three distinctly different types of final memorial: Interment in the park grounds, Entombment in the mausoleum or garden crypts, and Inurnment of cremated remains in the ground (urn garden) or columbarium, in our individual glass or marble-fronted niches. Because Tulocay is a non-profit, private cemetery, our services and pricing policies have always been set to meet the needs and desires of people in all walks of life. We welcome price comparison and encourage before-need planning. Napa County Landmarks (NAPACOUNTYLANDMARKS.ORG) hosts giuded tours once or twice a year or you can download the tour information and explore Napa history on your own.